SparkleTeam offers commercial cleaning, building and maintenance services to a wide range of commercial properties in Broward County, Palm Beach County, and North Miami Dade County. 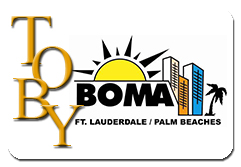 SparkleTeam is proud to serve several LEED Certified properties in the South Florida area and TOBY (The Outstanding Building of the Year) Award Winning Buildings that are serviced and supported by SparkleTeam during the TOBY judging process. Please select the necessary image below to view the property listings.